The following speech was given by Cynthia Hume, Komen Great Plains Board Member, at the ICAN 2017 Work/Life Challenge Women’s Leadership Conference on April 19, 2017. My daughter was 10 years old when I was diagnosed with breast cancer. My very first thought was that I didn’t want her to grow up without a mom. At every step of my journey – through all my treatments and challenges – I thought of my children and the impact it had on them. It was the ultimate “work/life challenge” to get better so I could be with them in my new future as a breast cancer survivor. I stand here today because I prioritized my health and had a mammogram — the best detection for breast cancer that we have today. But there are many women who don’t take advantage of this screening because they’re too busy. What could be a more vivid example of an unbalanced life? Since my diagnosis in 2005, treatment of breast cancer has greatly improved thanks in part to the more than $920 million dollars Susan G. Komen has invested in research – Komen is the largest nonprofit funder outside of the U.S. government of breast cancer research. I’m proud to say that I am one of more than 3 million breast cancer survivors in the United States today. Today I am in good health. My career is on track, and my family is well. I’m on the Board of Susan G. Komen and my company proudly supports the Race for the Cure every year. I want to be a reminder to all of you in this room – and to women throughout Nebraska – to make health an equal part of your work/life balance. 24 Nebraskans are diagnosed and four Nebraskans lose their lives to breast cancer each week. 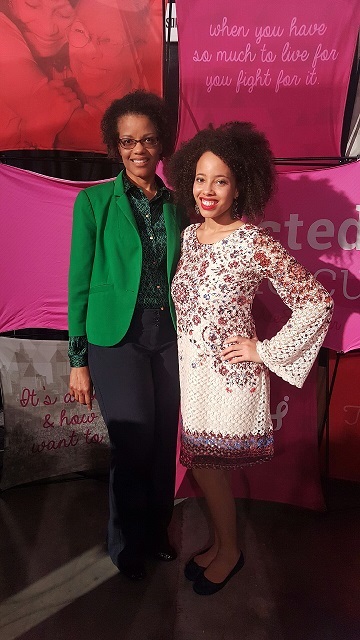 I also want to be a reminder to African American women – we are a population dying from breast cancer at a 40% higher rate than white women, even though incidence rates are equivalent. Genetics, access to care, financial issues, cultural norms all play a part, but getting screened and knowing about options can improve this reality. What can YOU do? First understand your personal breast cancer risk – speak with your providers and know when you need to have a mammogram and clinical breast exam. Get screened. Know what is normal for you – and that means knowing your body and recognizing when changes occur – and not just once a month. And lastly, live a healthy life style – eat right, exercise, watch your weight, and limit your alcohol intake. At this time I’d like to acknowledge breast cancer survivors and ask you to please stand and be recognized. And now anyone who has been impacted by breast cancer — perhaps you had a family member – your mother, sister or friend receive a breast cancer diagnosis — please stand with us. Take a moment to look around the room. As you can see, we all must work TOGETHER to reduce the number of women and families affected by breast cancer. I challenge you today to act, donate, get screened, and get involved by participating in the Race. Be more than pink! We encourage you to take the information on your tables and share it with your loved ones. Thank you.